NeoGAF user “Hero of Legend” has discovered a GameStop listing for a Wii U version of Ubisoft’s upcoming open-world computer-hacking game, Watch Dogs. While this is not a confirmation that a Wii U version is in the works, it does suggest that the publisher’s plan to port their games across multiple platforms is not just a one-way street headed out from Nintendo’s console. In total GameStop lists Watch Dogs for the Xbox 360, PlayStation 3, PC, and Wii U. Ubisoft has only confirmed the game for release on the PS3 and Xbox 360 “for sure“, however, the impressive demo shown last year at E3 was confirmed to have been running on a PC. This suggests that the GameStop PC listing is also accurate. The new GameStop listing comes just days after a poster advertising pre-orders for Watch Dogs reportedly leaked to the Internet. That promotional material listed the game for release “Holiday 2013” on “all home consoles”, and included wording that suggested that it might also be released on the next generation of Xbox and PlayStation consoles. For the record, Ubisoft has not confirmed the authenticity of the promotional material. You should never count (or watch) your chickens (dogs) before they hatch, so it is best to consider the Wii U version of Watch Dogs a rumor until Ubisoft gives us the high sign. With that said, whoever updated the GameStop website to show the game for Nintendo’s console most likely has better things to do than sit around and make up fake game listings — or at least, we hope the do. Odds are this is the real deal. We will keep an eye out for any official word from Ubisoft on Watch Dogs intended platforms and when they plan to launch the game, and will update you as soon as we find anything out. In the meantime, make sure to let us know in the comments if a Wii U version is something you would be interested in. 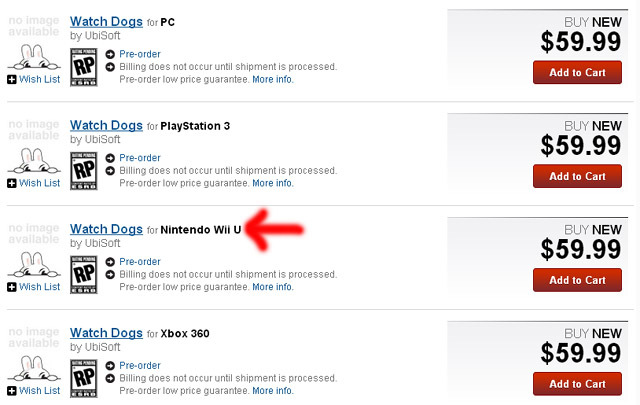 [Update] Best Buy has also updated their online listing for Watch Dogs to indicate a Wii U version. [Update 2] Ubisoft has officially confirmed a Wii U release for Watch Dogs.